"Error retrieving information from server. [ RPC: S-5:AEC-0]." 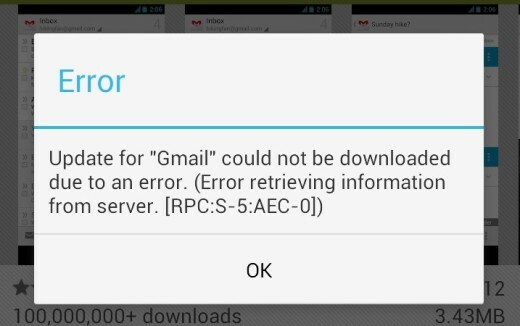 This error occurs when you download or update an app from the Play Store. While it is a relatively common problem, there have been many Galaxy S3 owners complaining about it. Basically, it is a Play Store problem and the good news is, Google already acknowledged it. So, we could expect a permanent solution to the problem anytime soon. In the meantime, while waiting for that "permanent solution" here are the things you could do to remedy or work around the problem. 1. From the Home screen, tap the Menu button. 4. Swipe left twice to choose All tab. 6. Tap Clear Cache button. You don't have to re-setup your Google Account to be able to download and install apps from the Play Store again when you do this. Tapping the Clear Data button, however, will delete your personal settings so beware. 1. Tap the Menu key from the home screen. 4. Swipe to choose All tab. 6. Tap Uninstall Updates button. Doing this will roll back the Play Store to its previous version, the one that may have been working well. The problem occurs during app downloads or updates so one of the services you need to look into is Android's stock download manager. Clearing its cache and data may solve the problem. 7. Tap Clear Data button. 1. From the Settings menu, choose Applications Manager. 2. Swipe left to choose All tab. 3. Find Google Services Framework and tap on it. 4. Touch both Clear Data and Clear Cache buttons. Are you currently experiencing some problems with your phone and don't know how to fix it? Email us at sebertech@gmail.com and we will help you find solutions / fixes to your concerns.